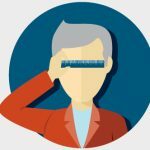 At Readers.com™, measuring to find your perfect reading glasses size is different than measuring for a pair of optical glasses. If you own a pair of prescription eyewear, you may be accustomed to the three-number frame measurement format (lens-bridge-temple) listed on the inside of the temple. Those optical measurements can be used as a guide, but they are different than the measurements we’ve found are most helpful for our customers. To get an idea of the right reading glasses size for you, we recommend taking a pair of glasses or sunglasses that you know fit your face well and measuring those for the following dimensions. Alternately, you can use our printable ruler to measure your face from temple to temple. This measurement is taken at the tallest part of the frame front from the bottom of the frame to the top of the frame. This measurement includes the frame on the top and bottom of the lens. Available frame heights range from very small (13-24mm) to very large (50-75mm). To measure temple length, place your ruler at the hinge and measure straight back to the end of the temple. The correct temple length is important because it ensures that the frame rests comfortably on and behind your ear. We’re proud to offer temple lengths ranging from shorter (110-130mm) to long temples (145-160mm). Please note: We do not measure around the curve of the temples, and instead measure straight back to the end of the temple. Bridge size is important because it keeps your glasses firmly on your nose. To determine the bridge size, measure across the bridge from lens to lens at the point where the lenses sit closest to each other (where the glasses will sit on your nose). Our bridge sizes include narrow (10-19mm), average (20-21mm), and wide (22-34mm). Your reading glasses are an important tool to help you see more clearly, but they should also complement your face shape so you can wear them with confidence! 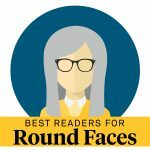 The general rule of thumb is: the more round your face shape (round and oval), the more angular your frames should be; and the more angular your face shape (square and heart), the rounder the frame shape. 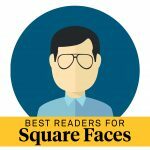 Square faces should avoid retro square, rectangle, or square readers and instead opt for aviator, cat eye, or round frames. 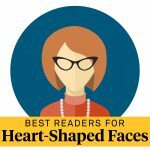 Heart-shaped faces should steer clear of round or oval frames, and migrate towards rectangle, retro square, or cat eye frames. 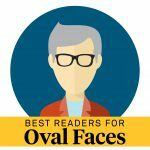 Oval faces have the most flexibility with frame shapes, but they tend to look best in round, rectangle, or retro square frames. Round faces should avoid round or oval frames and look for browline, rectangle, or retro square frames. Want to learn more about the frame and face shape dynamic? Check out our Face Shape Guide.